There’ll be no mistaking who you support in Canterbury’s Forever Blue O/H Hoody. 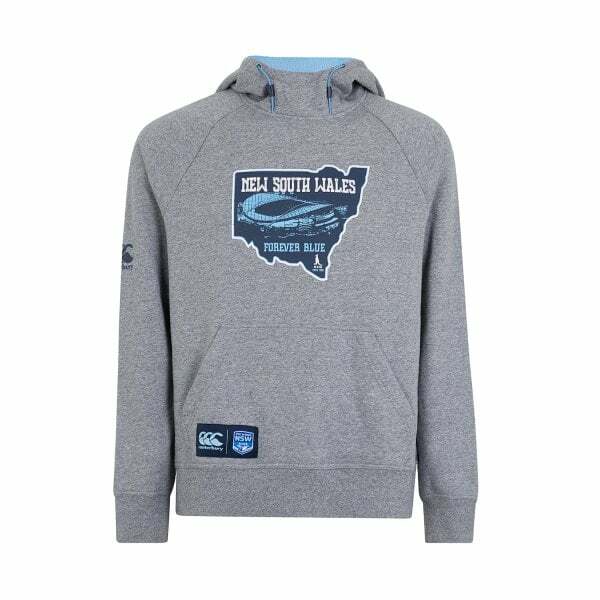 That’s because this quality over the head raglan sleeve hoody has a map of NSW emblazoned on the chest; the state to be in for State of Origin. Canterbury’s Forever Blue O/H Hoody is the classic hoody for NSW Origin fans who want to look the part while supporting the game. This over the head raglan sleeve hoody has a contrast lined hood and is made from cotton and polyester brushed back fleece for maximum warmth. It also has kangaroo pockets in the front and map of NSW on the chest, so no one’s in any doubt which side of the border you’re from. Finished with the CCC logo showing your membership of the Canterbury clan, this hoody is ideal cold weather supporters wear and is available from our 2019 NSW Supporters collection.